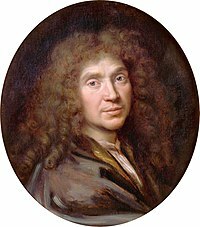 Jean-Baptiste Poquelin, known by his stage name Molière (/mɒlˈjɛər, moʊl-/; French: ; 15 January 1622 – 17 February 1673), was a French playwright, actor and poet, widely regarded as one of the greatest writers in the French language and universal literature. His extant works include comedies, farces, tragicomedies, comédie-ballets and more. His plays have been translated into every major living language and are performed at the Comédie-Française more often than those of any other playwright today. His influence is such that the French language itself is often referred to as the "language of Molière". Despite the adulation of the court and Parisians, Molière's satires attracted criticism from churchmen. For Tartuffe's impiety, the Catholic Church denounced this study of religious hypocrisy followed by the Parliament's ban, while Don Juan was withdrawn and never restaged by Molière. His hard work in so many theatrical capacities took its toll on his health and, by 1667, he was forced to take a break from the stage. 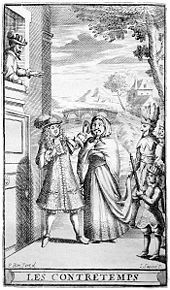 In 1673, during a production of his final play, The Imaginary Invalid, Molière, who suffered from pulmonary tuberculosis, was seized by a coughing fit and a haemorrhage while playing the hypochondriac Argan. He finished the performance but collapsed again and died a few hours later. 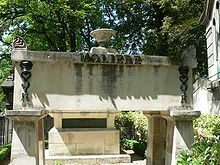 Molière was born in Paris, the son of Jean Poquelin and Marie Cressé, the daughter of a prosperous bourgeois family. Upon seeing him for the first time, a maid exclaimed, "Le nez! ", a reference to the infant's large nose. 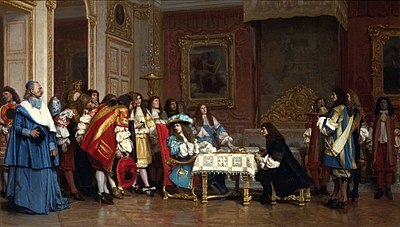 Molière was called "Le Nez" by his family from that time. He lost his mother when he was ten and he did not seem to have been particularly close to his father. After his mother's death, he lived with his father above the Pavillon des Singes on the rue Saint-Honoré, an affluent area of Paris. It is likely that his education commenced with studies at a Parisian elementary school; followed by his enrolment in the prestigious Jesuit Collège de Clermont, where he completed his studies in a strict academic environment and got a first taste of life on the stage. In 1666, Le Misanthrope was produced. It is now widely regarded as Molière's most refined masterpiece, the one with the highest moral content, but it was little appreciated at its time. It caused the "conversion" of Donneau de Visé, who became fond of his theatre. But it was a commercial flop, forcing Molière to immediately write Le médecin malgré lui (The Doctor Despite Himself), a satire against the official sciences. This was a success despite a moral treatise by the Prince of Conti, criticizing the theater in general and Molière in particular. 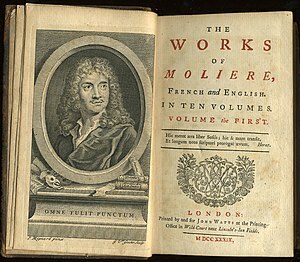 In several of his plays, Molière depicted the physicians of his day as pompous individuals who speak (poor) Latin to impress others with false erudition, and know only clysters and bleedings as (ineffective) remedies. Les Femmes savantes (The Learned Ladies) of 1672 is considered another of Molière's masterpieces. It was born from the termination of the legal use of music in theater, since Lully had patented the opera in France (and taken most of the best available singers for his own performances), so Molière had to go back to his traditional genre. It was a great success, and it led to his last work (see below), which is still held in high esteem. In Les Fourberies de Scapin, Act II, scene 7, Géronte is asked for ransom money for his son, allegedly held in a galley. He repeats, "What the deuce did he want to go in that galley for?" ("Que diable allait-il faire dans cette galère?") The phrase "to go on that galley" is used to describe unnecessary difficulties a person has sought. Note that a punishment in 16th and 17th century France was condemnation to life as a galley slave. In Le médecin malgré lui, forced to impersonate a doctor, the chancer Sganarelle examines a young woman who is faking muteness in order to delay an arranged marriage. He then delivers to her father a "diagnosis" which consists of strings of gobbledygook, dog latin and recursive explanations which conclude with an authoritative "and so that is why your daughter is mute" ("Et voilà pourquoi votre fille est muette"). The phrase is used wholesale to mock an unsatisfactory explanation. ↑ Randall, Colin (24 October 2004). "France looks to the law to save the language of Molière" – via www.telegraph.co.uk. ↑ "Who Speaks the Language of Moliere?". www.americanthinker.com. 1 2 Roy, p. 756–757. ↑ Shelley, Mary Wollstonecraft (1840). Lives of the Most Eminent French Writers. Philadelphia: Lea and Blanchard. p. 116. ↑ Brockett, Oscar (2008). History of the Theatre. USA: Pearson. p. 199. ISBN 978-0-205-51186-0. ↑ O'Malley, John W. (2014). The Jesuits; a history from Ignatius to the present. London: Sheed and Ward. p. 30. ↑ Martin Barnham. "The Cambridge Guide to Theater." Cambridge Univ. Pr., 1995, p. 472. 1 2 3 4 5 Au, Susan (2002). Ballet and Modern Dance - Second Edition. London: Thames & Hudson LTD. p. 23. ISBN 978-0-500-20352-1. ↑ Au, Susan (2002). Ballet and Modern Dance - Second Edition. London: Thames & Hudson LTD. p. 26. ISBN 978-0-500-20352-1. ↑ Au, Susan (2002). Ballet and Modern Dance - Second Edition. London: Thames & Hudson LTD. p. 25. ISBN 978-0-500-20352-1. 1 2 Au, Susan (2002). Ballet and Modern Dance - Second Edition. London: Thames & Hudson LTD. p. 24. ISBN 978-0-500-20352-1. ↑ ""Molière: Introduction" ''Drama Criticism''. Vol. 13. Ed. Linda Pavlovski. Gale Group, Inc., 2001. Accessed: 28 Nov, 2007". Enotes.com. Retrieved 2010-03-09. ↑ "Bibliography" in Curtis Hidden Page, trans., French Classics for English Readers: Molière New York & London, G.P. Putnam's Sons, 1908, Vol. 1, p. xliii. Retrieved 2010-06-27. ↑ Olive Classe, ed., Encyclopedia of literary translation into English: M-Z, Volume 2 London: Fitzroy Dearborn Publishers, 2000, Vol. 2, p. 958. Retrieved 2010-06-27. ↑ "Preface to the Translation" in Curtis Hidden Page, trans., French Classics for English Readers: Molière New York & London, G.P. Putnam's Sons, 1908, Vol. 1, p. xxxi. Retrieved 2010-06-27. ↑ Hume Cronyn, A Terrible Liar: A Memoir, New York: Morrow, 1991, p. 275. Accessed via Google Books on 1 Nov. 2009. Retrieved 2010-03-09. ↑ "Bellinger, Martha Fletcher (1927) ''A Short History of the Drama'' New York: Henry Holt & Company. pp. 178-81. Accessed: Nov 27, 2007". Theatredatabase.com. Retrieved 2010-03-09. ↑ "The Imaginary Invalid". The Encyclopaedia Britannica. Retrieved 25 February 2019.